Hovea lanceolata is a member of the Fabaceae family and develops into an upright, small to medium shrub. Leaves are up eight centimetres long, oblong to elliptical, deep green above and greyish-brown with rusty hairs beneath. 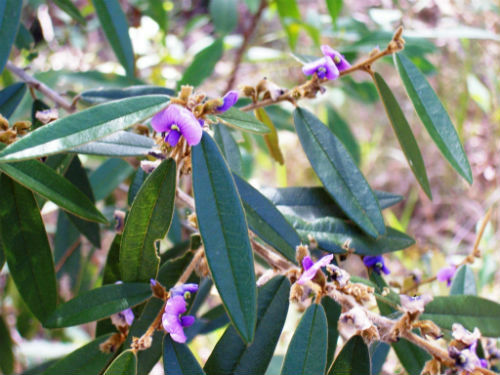 The pea shaped flowers are bluish purple and borne in axillary racemes. During late winter to early spring the flowers are both conspicuous and profuse. The swollen pods, that follow the flowers, hold number of hard-coated seeds. The pods, when they ripen, split and shoot seeds out for some distance. We once had pods in a room and on ripening they shot out seeds in all directions. This is a very efficient means of seed dispersal especially when pods ripen outside. H. lanceolata occurs in north-eastern NSW as well as Queensland. Like many of the Fabaceae family H. lanceolata is not well known in cultivation but has great horticultural potential. Propagation is from seed that needs to be soaked in hot water, to soften the hard seed coat, before sowing. Propagation may also be possible from cuttings.